Following a concerted campaign, the Princess has had her ears pierced. I remember getting my own ears pierced at 12 and my father commenting disapprovingly on bodily mutilation and comparing it to the neck rings African women sometimes have which I think was a little harsh. Herself is, in any event, very pleased. 1. From her – when can I have my tongue pierced? 2. 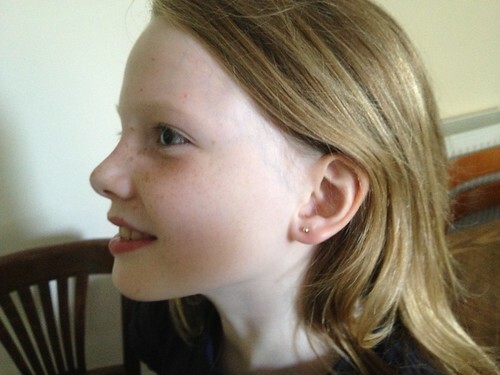 From Daniel – when can I have my ears pierced? Very difficult, from a feminist perspective to justify a negative response to question 2; I was reduced to saying “well, we’ll see how you feel about it when you’re 10” and hoping for the best.